in turn helps keep you healthy. Salt is also a natural detoxifier. exfoliate your skin, removing the outermost layer of dead skin cells and leaving your skin softer and smoother. Palmetto FL area, contact me to purchase and save shipping charge. You have a choice of base oils, salts and blends/mixes. Sea salt and Epsom Salts Fine Grain Sea Salt is a rich source of minerals, and it offers numerous beauty, skin and personal care benefits. Dead Sea Salts This is the most unique salt when it comes to the good stuff. They are ten times higher in trace minerals than other salts. .
Potassium helps regulate the moisture level of the skin, Magnesium helps promote healing, and Bromide has a smoothing and relaxing effect. promotes healthy skin by exfoliating and encouraging regeneration of new skin cells. only pretty—it’s good for you! softener and helps you do away with dry and hard skin conditions. It can assist in preventing wrinkles and adding collagen. age spots and scars. Penetrates to boost collagen production, moisturizing and smooths skin. It may reduce itching and skin inflammation. especially beneficial for people who have oily skin. 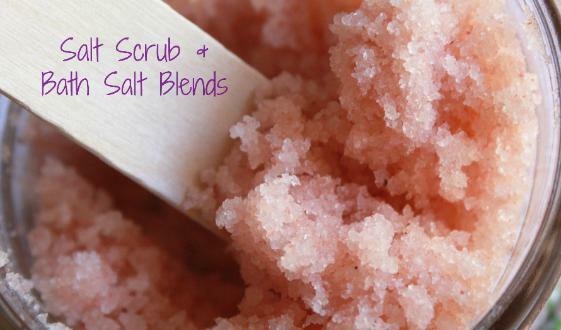 Vitamin E is added to all salt scrubs to act as a natural antioxidant and lengthen the shelf life of this oil. Calm the beast within A blend of essential oils to calm that tension, nerves and stress. A blend of bergamot, orange and lavender. dream enhancing. This blend is great on your skin. A blend of chamomile, jasmine, rose, clary sage and lavender. Masculine blend This blend is designed for that manly scent. (but great on women too). Blend of sandalwood, cedarwood and bergamot. Romantic time This blend of essential oils create that romantic atmosphere. A blend of Ylang Ylang, rosewood, jasmine, neroli and vanilla. Passion boost A blend of essential oils for mood lifting and romance. A blend of vanilla and grapefruit. geranium, palmarosa, rosewood, cedarwood, patchouli and vetiver. Tropical Paradise A blend that will your imagination thinking about a beautiful beach on a tropical island. A blend of coconut, vanilla and lime. Relax the muscles This blend is for muscle aches and for relaxing. A blend of lavender, eucalyptus and rosemary. Just chill A blend that will have you feeling peace, bliss and that chilling feeling. A blend of lavender, cedarwood, orange and ylang ylang. Tranquility A relaxing and stress relieving blend. A blend of lavender, chamomile, marjoram and sandalwood. palmarosa, lemongrass, eucalyptus and rosemary. night time too. A blend of geranium, ylang ylang, rose and bergamot. Rescue me This blend is for those that give over 100 percent of themselves. A blend of lavender, rosemary, eucalyptus, fir and peppermint. Concentrate and focus A blend that assist in focusing and concentrating. A blend of rosemary, lemongrass, orange, ginger and grapefruit. blend is great for acne, normal and oily skin. A great detoxifier. peppermint, rose, sandalwood and ylang ylang. easier to spread the salt scrub over your skin. to two minutes to remove dead skin and exfoliate. After you have applied the scrub it’s time to wash off in the shower. Be careful because the scrub can make the tub or area slippery. teaspoon (and more) for the feet. After applying wash off and dry. can make tub very slick. It is best to use a bath mat for safety. Clean tub well after use so next person using tub will not slip. Use the body scrubs no more than once or twice a week, as overuse can strip your skin of valuable oils. Do not rub too vigorously on sensitive parts and skin. Be careful not to slip when applying, the scrubs may make things slippery, use caution. Finish off applying a natural body moisturizer. Drink plenty of water to help with the exfoliation and detoxification process. Always test on an area of your skin before using. Not recommended for use on the face. It’s important to use a spoon for the scrub; otherwise bacteria, soap, and water from your hands may contaminate the mixture. Please be mindful when using in and around the shower or bath as scrub has the potential to leave a slightly slippery surface. Some of the salt scrubs have coconut oil in them. If you are allergic to nuts, you may have an allergic reaction. I make these salt scrubs with no added preservatives; please avoid getting water inside container to prolong shelf life. Some essential oils may cause skin to tingle. If you develop skin irritation, discontinue use. Do not apply to cut skin or scratches or it will sting. not wash the area during test time. If there is no sign of irritation, burning, itching, redness or swelling, then it should be safe for you to use. Pregnant women should consult their health care professional before using any products that contain essential oils. container in a thick zip lock back to prevent odors from the refrigerator to penetrate in product. site to be construed as medical advice. Contact your Health Care provider immediately if you suspect that you have a medical problem. of essential oils. Please check with your health care professional and Certified Aromatherapist before ingesting any essential oils. allergies or negative results, which may result from the use of our products. when purchasing and using our products.